Let’s Get Serious… and Do a Giveaway! Romance novels are lighthearted fluff, right? No chance that you’ll encounter any real issues or frightening problems. They’re simple love stories about happy people. The two books I have coming out this spring both feature significant, non-fluffy issues. 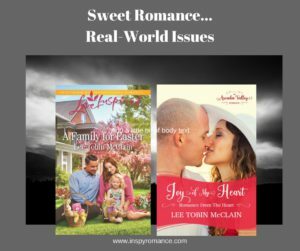 That’s one of the reasons I adore writing Christian romance; I can address much more serious issues, issues that can only be overcome with God’s help. But just to make this post fun (despite the seriousness), I’m going to do a quiz. Take a look at the covers above, TODAY, and match them with the following serious issues—there are two in each book. I’ll reveal the answers at the end of the day on my Facebook Page. And tomorrow I’ll choose a random commenter to get a copy of an earlier book in each series—an ebook in the case of Arcadia Valley, and a signed paperback in the case of the Love Inspired books. Have you signed up for my newsletter yet? If not, you can do so right here. You’ll get news of my latest releases, and the occasional freebie as well. Stay in touch! Hi Lee, I hear those sentiments so frequently that I am selective when telling others that I read inspirational romance- the sceptical, raised eyebrows and derisive comments are pretty regular!! It always makes me shake my head when people disrespect Christian romance. Have they ever read one? Most of my fellow writers also include serious issues in their books. Hi Lee! Interesting interactive post. As a reader, I am amazed and intrigued by the themes and issues included in inspirational romances. That is what makes it fun to explore different authors and their works. Two delightful covers and four modern issues. Best wishes on your upcoming release. Thank you, Renate! Glad you like the covers. Thank you for reminding me of what’s really important to be more aware of. I’m guessing at least one of the above issues hits home for everyone who reads this post. Even people who seem to have it all together usually have some struggles inside. That’s why I don’t like writing about perfect people with no problems… I don’t think they exist! I know so many people who won’t touch Christian fiction. Makes me sad. Our local library in California doesn’t have a lot of Christian romance and our closest Christian bookstore is about an hour’s drive away. And we live in a big city! Thankfully I can order off of Amazon but sometimes it’s just nice to browse a little. There is a company, The Book Faeries, that makes stickers to put on the front of books that say “Take this book, read it & leave it for the next person to enjoy.” I have done this with several books. Ten to fifteen years ago, there was a lot of fluff in Christian romance. I’m glad authors are embracing non-fluff and authenticity in today’s market. Although there are some readers who want nothing but a feel-good, happily-ever-after, dream world, I think the majority appreciates relateable and even challenging circumstances in fiction. Looking forward to your stories, Lee! You’re right, Beth–I love how the genre has changed and developed. There’s still room for a lighthearted love story, but many readers enjoy the challenging stuff. Thank you for being a supporter of Christian fiction of all types. I am right there with you on the happy ending, Margaret! And don’t worry about having no information–nobody does, except for the book covers. That’s why I’m choosing my winner randomly! It’s only fair. I really enjoy reading books in which God helps characters to overcome their issues. I like when I can be inspired from the story! I am anxiously awaiting A Family for Easter’s release! I enjoy Christian fiction because they are clean,inspirational and they deal with problems of the day. I enjoy Christian Fiction and I am so happy that you and other authors choose to write these books. You can’t really tell by the cover. However, I’ve shed many a tear over a romance like yours. Some I get historical info that applies to our ancestors . Keep up the good work. Issues that only God can help you through, are why I read good Christian Stories. So please don’t stop writing them! I like both the fluffy and the real issues books. Sometimes when life gets hard, a little fluff is just what I need. But too much of it can leave us in a false reality. i forgot to say letters for JOMH and they are a and d. also for AFFE my letters are b and c.